I never knew my maternal grandparents “Ma & Pa” because, as readers of newsandviewsjb know I am fond of mentioning, I am the youngest of seven with a big gap between my oldest siblings and myself – so I missed out on knowing some of the family who had passed on. Nevertheless, I have heard many a story about them. One of my favorite “Ma & Pa” (Delia Roberts Generous & Henry Generous, Sr.) stories is of “Pa and his baseball” and “the elopement.” In his later years Pa worked on the railroad as an inspector and at a thread mill, but in his youth he was a professional athlete. He boxed and played baseball, his passion being baseball and a desire to make it to the big league. 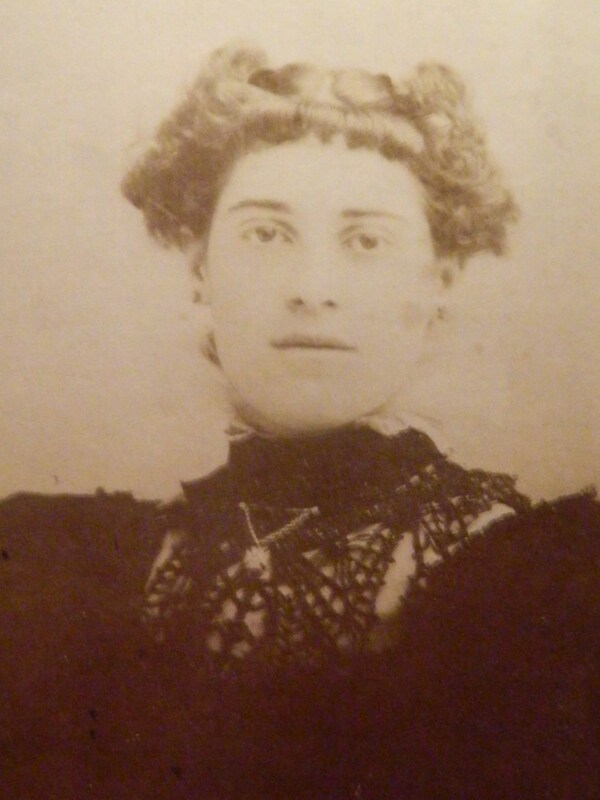 According to my mother, Ma’s father (Tom Roberts) got fed up with Pa’s preoccupation with “his baseball” and advised Ma to accept a marriage proposal from another suitor. When Pa learned of the plan he took swift action to secure the hand in marriage of the girl he loved – even more than baseball! 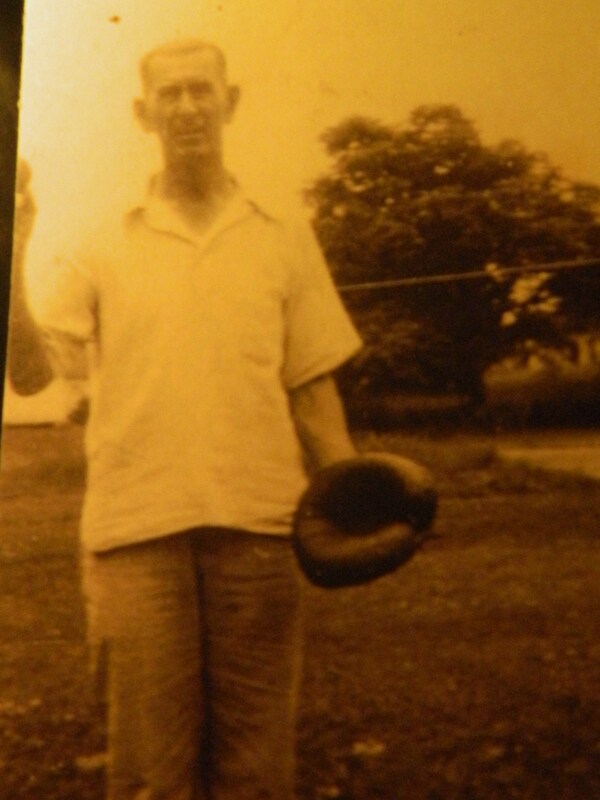 Even in his golden years Pa was was still often seen with his baseball mitt in hand – his position was catcher. From what I was told about him, Pa would have beamed with pride to know he not only had great-grandsons who played competitive baseball but also great-great grandsons and a great-great granddaughter who played softball. In addition, Pa was said to be an accomplished juggler and tight rope walker. Mom used to tell us that as a little girl she practiced his calisthenics with him. With an umbrella in hand for balance, she even walked barefoot across the backyard clothesline under Pa’s watchful eye! In his golden years, “Pa” Henry Generous, Sr. often had his baseball mitt in hand. There was nothing quite like the rich aroma of homemade bread in the oven waifing its way up the stairwell in the early morning from my mother’s kitchen. Generally through the year it was unpredictable as to when the urge would hit Mom to bake homemade bread – using her mother’s, “Ma’s” recipe. However, come the holidays that aroma was one that signaled Christmas was near. Also, there is a superstition to which my mother subscribed associated with always placing bread on the dinner table to ensure your family will never go hungry. Traditionally, Mom served “Ma’s Baked Bread” on a flower trimmed plate which had belonged to my grandmother. 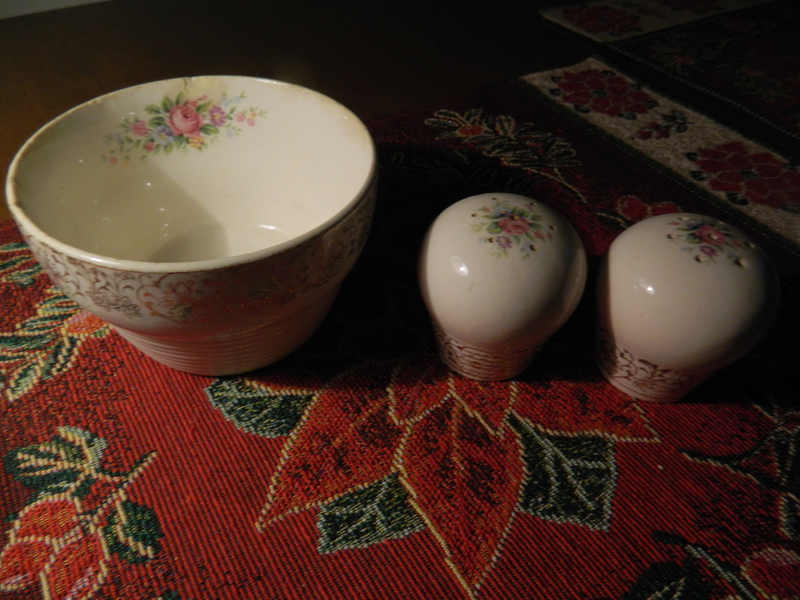 I no longer have the plate but do have a matching bowl and salt and pepper shakers that were part of that set of Ma’s dishes. I used to love having a thick slice of Mom’s homemade bread the morning after Christmas, toasted then topped with a dollop of peanut butter. My sister Candy reminded me that Mom would also take rounded portions of Ma’s bread dough, flatten them with a spatula in the skillet and grill them – creating fried dough, which Mom called “dobbies”. 1 and a half quart lukewarm water; one half cup sugar; 1 tsp. salt; 1 tablespoon Crisco; 1 yeast cake; 8 cups sifted flour. Put 6 cups sifted flour in large bowl with sugar, salt and lukewarm water – mix well. After adding the water, add Crisco. (1 cup lukewarm water with yeast cake dissolved in it should be added to mixture and again mix well); Last, add the remaining two cups of flour and mix again. Let rise overnight – cover well with wax paper. The following morning remove wax paper and bake one hour. The oven temperature was missing from this recipe so I searched online and found that homemade white bread is often baked at 450 degrees. If anyone tries this recipe I would be interested in knowing how it comes out. 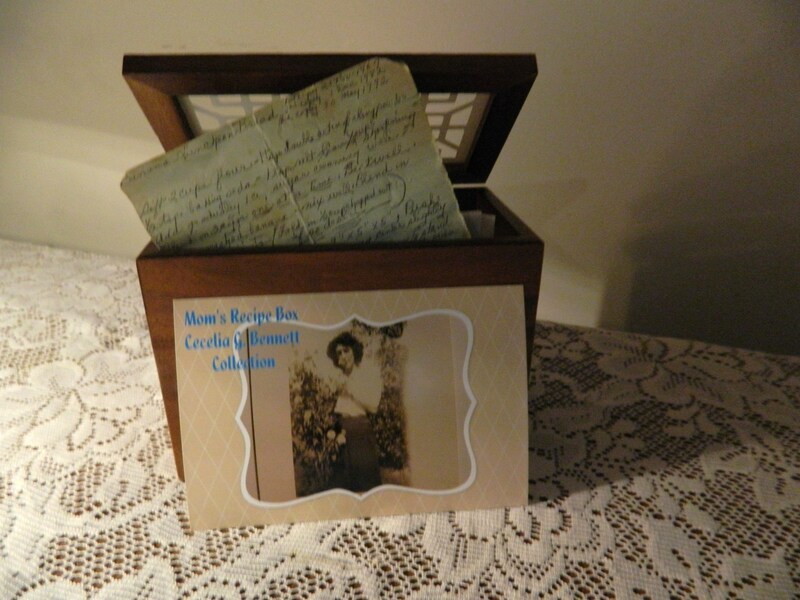 Her sister Anna’s Ice Box Cookies can be found in Mom’s Recipe Box. 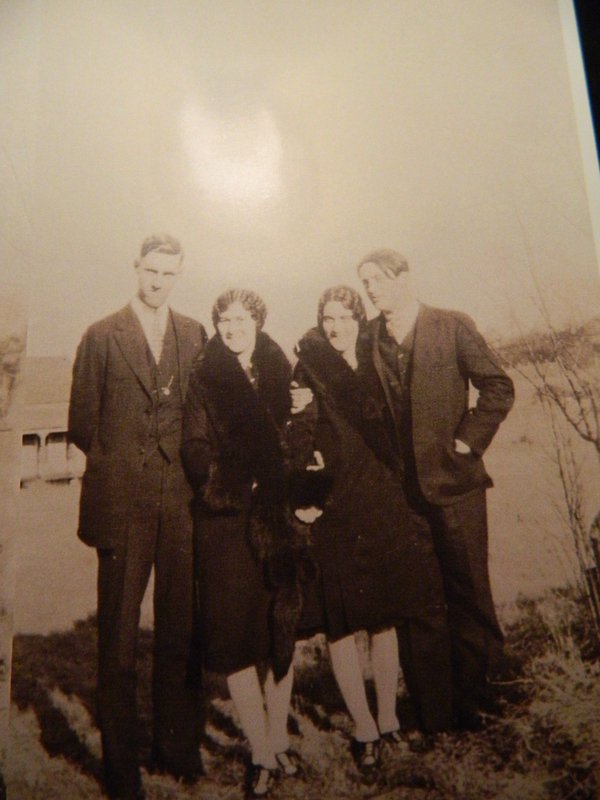 (The Generous sisters Anna and Cecelia – Mom – shown with their husbands Perce Spiller and John F. Bennett, Sr. – Dad). “Aunt Anna”, my mother’s sister Anna Generous Spiller, as I recall was not a big fan of cooking and baking. However, there are a few things she is remembered for preparing, including her “Ice Box Cookies”, especially at Christmastime. Mom and Aunt Anna were close throughout their lives. Though personality wise they were very different, I used to get a kick out of listening to them talk when they were together and their ole’ New England Yankee pronunciations of words such as “pa-ta-dah” (potato). They both had a habit of clicking their nails while periodically gazing off into the distance as they spoke. And, they both possessed that well-known Generous Family determination!! 2 cups brown sugar; 1 cup butter or (the recipe calls for Spry but a contemporary version of that would be Crisco in a can); 2 unbeaten eggs; 1 tsp. salt (level); I tsp. 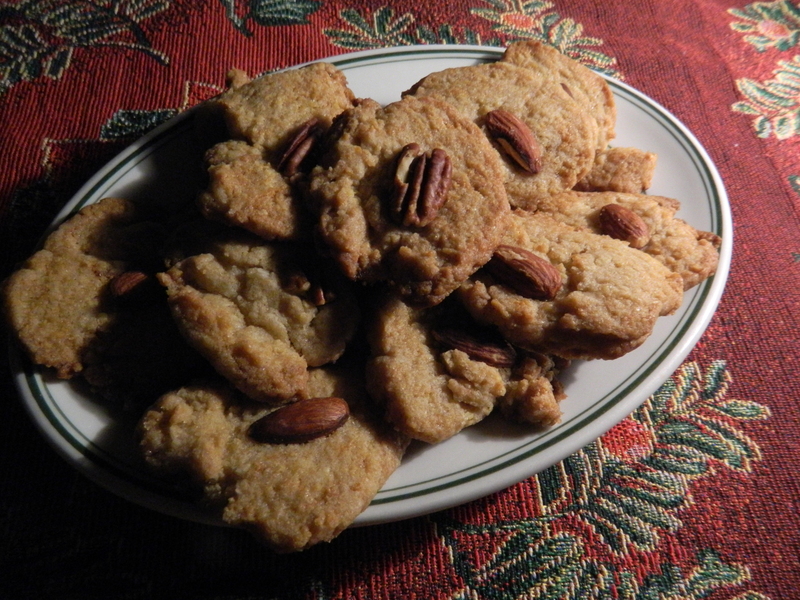 baking soda; 1 tsp vanilla; 3 and one fourth cups flour; 1 cup chopped English walnuts. Cream together butter or Crisco with brown sugar, then cream in the unbeaten eggs and add vanilla; In a separate bowl, mix together all dry ingredients then gradually add to the creamed mixture – stir well. Add walnuts. Roll and shape like a rolling pin, cover with wax paper wrap and place in refrigerator overnight. The next day, remove from refrigerator, take off wax paper, then slice roll and bake in 400 degree oven 7 to 10 minutes (watch closely). Rather than mixing in chopped walnuts I opted to place walnut and almond pieces on the cookie tops.